Incredible case sofa in the style of designer, Milo Baughman. This piece came to us in simply beautiful condition and was recently reupholstered in this clean and modern fabric. Fabric is in Fantastic condition with no signs of wear at all. One up close photo shows the color perfectly. Wood is shiny and rich with only a corner repair as shown. Brass strips are in place with no breakage. 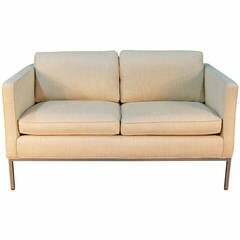 Measures: 90" long 34" deep 26" high Seat depth - 23" Seat width with pillows - 74" W Seat width without pillows - 84" W.
Very elegant Milo Baughman style sofa, by Flair, curved chrome-plated steel frame, newly upholstered in Maharam Kvadrat fabric (#460830, color 220) in excellent conditions. Midcentury "Cube" sofa designed by Milo Baughman, circa 1970s. Solid oak frame refinished in a walnut tone. Tufted scoop seat are newly reupholstered. Milo Baughman sofa loveseat with chrome side frame wraps. Elegant. Unique, circa 1970s. Very good original condition. Cotton upholstery. 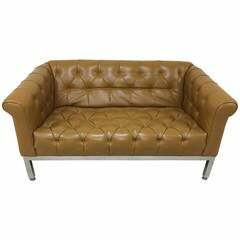 A mid century modern loveseat or sofa designed by Milo Baughman and made by Thayer Coggin. Original striped upholstery on a chrome plinth base. Modern sofa by Milo Baughman for Thayer Coggin freshly upholstered in lush pink and grey velvet. Perfect addition to any space in search of a modern and clean look.